Edit: (2016-05-01) Note that Overcast is now completely free with a new patronage model. Smart speed and voice boost are now included in the free price. Overcast is a podcast player app that is free in the app store with in-app purchases to unlock additional power features, discussed below. I’ve been an avid Downcast user across all my platforms but have been using Overcast exclusively for the last month, I doubt I will go back. Overcast is an app made by Marco Arment, the same guy that created Instapaper (now sold). Marco is well known for creating apps with those features you either didn’t realise you needed, or you always said to yourself ‘I wish this app had feature x’. Overcast is no different, not so much in the free version but definitely in the additional paid features. Overcast has an incredibly minimalist and clean design in the spirit of the changes that were derived in iOS7. The UI is consistent between the iPad and iPhone, note that there is no desktop app. If you wish to listen to your podcasts you can do this via overcast.fm. One of the things I liked about Downcast was the fact it had an OS X app, however, I rarely if ever used it. Yes you heard that right, you don’t need to create one but it sure helps. Why do you need an account? Well, Overcast is cloud powered which offers some distinct advantages most other podcasting apps. 1. Speed, battery life, and data usage*: The servers do the heavy lifting of constantly checking for updates so your device doesn’t need to download each show’s entire feed every few minutes to make sure you get new episodes quickly. The servers send only what’s new to the app, and it only takes a few seconds. This saves substantial battery power and data usage over time. 2. Sync and backup*: Your podcasts and progress are always synced between your devices and overcast.fm. You can log into your Overcast account from a new or restored device and everything’s right where you left it. 3. Web features*: Logging into overcast.fm offers basic playback and will offer more features in the future, such as adding podcasts from your computer. * text taken directly from the overcast website. The two features in bold text, in my opinion make this paid upgrade entirely worth it. Voice boost enhances the audio track to make voices louder and clearer. This is really handy if you listen to podcasts whilst doing something like housework, walking home near a busy street or hearing more clearly over your car engine noise. Toggling this feature on/off really shows how much of a benefit it is. By far my favourite feature is Smart Speed. Smart Speed removes the pauses between voices to shorten the overall podcast length. As an example this feature saves me on average 6 minutes per Mac Power Users (MPU) Podcast. It should be noted that this speed saving is above and beyond any podcast speed setting you have made. Thus, if I have set my podcast to play at 1.5x the speed the 6 minutes is above and beyond that, so you save far more time than 6 minutes per episode. I have been catching up on 10 or so episodes of MPU recently and have saved 59mins using this feature, almost one episode of the podcast. Speed Boost Saved 59 mins so far! A lot of people will not see the value straight away with this feature, but how much do you make an hour in your daily life? I make more that £3 per hour, so the app has already paid for itself in saving me one hour of my life. Overcast makes it easy to discover new content, simply clicking the ‘+’ symbol at the top right of the app will launch a screen that presents you with a search box to make a direct search. You can also tap a ‘Twitter Recommendations’ button to get recommendations from those that you follow on Twitter. Whilst I see the advantage of this button, I do personally get a little frustrated with apps that assume we all like Twitter or Facebook, personally I despise both and no longer use one of them. Below the Twitter button Marco has provided you with a good handful of starter kits, which can be seen in the screen shot below. Ultimately this is how I found a good handful of new shows that I now listen to. Your online account at overcast.fm stores your podcast playlists and is responsible for pushing the new copies to your devices. The episodes don’t download in the background, you need to open the app. It also appears that if you do a clean install on your device and have to re-download all your pending episodes you will need to leave the app open whilst it does so. The app does not seem to keep downloading whilst it isn’t in the forefront, your milage may vary. The online account also acts as an online player for your podcasts, allowing you too play your podcasts in your browser. There is a control panel in the settings where you can toggle each and every one of your podcasts and whether you want to receive notifications when there are new episodes. The playlists functionality is fairly straight forward, allowing you to create a playlist name such as ‘Gym’ and decide which podcasts you want on that playlist. There is also an option to add ‘Select Priority Podcasts’ allowing those podcasts to play before any others on your playlist. There is even the functionality to exclude episodes, though that isn’t very useful if you use playlists like most people, to be automated. Sharing comes in two flavours, sharing a whole episode or sharing a current time in an episode. Simple really…. The author has used Apple’s own Podcast application as well as Downcast. Downcast does have one great feature beyond Overcast, the ability to automatically download episodes based on location. That means you can have it download episodes when you arrive home from work each night. The Apple solution is fairly basic, really only carrying out the core tasks that any podcast player should. 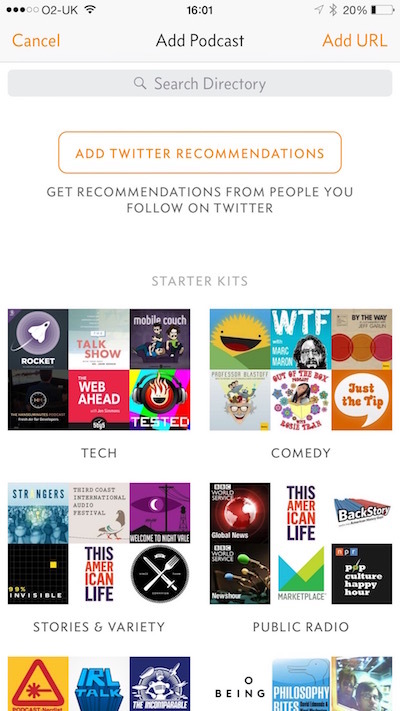 Would we recommend Overcast, it is our podcast player of choice at the time of publishing. The only real limitation of Overcast is the fact it cannot stream podcasts on the fly and needs to fully download it before it will play. You can get Overcast for free but we highly recommend the small price to unlock the advanced audio features, the Smart Speed of which is worth it alone. Note: Since starting the draft of this article, Overcast has gone on to save the author a further 7 hours of time using the Smart Speed feature. Note: Other Podcast apps you may want to look at include: Pocket Casts, Castro and Downcast. You can keep in touch with Apple Resource on Twitter, Facebook or via our Newsletter.